Due to the overwhelming response by research specialists around the world in 1999 (Birmingham, England), 2001 (Munich, Germany), 2003 (Osaka, Japan), 2005 (Cairo, Egypt) and 2007 (Rio de Janeiro, BRAZIL), the International Association of Judo Researchers is pleased to announce the 6th International Science of Judo Symposium. The World Research Symposium will be held prior to the 2009 World Judo Championships in Rotterdam, Netherlands, on Tuesday, 25 August 2009. The World Research Symposium will include research symposia, oral presentations, and poster presentations of research. This document is the first call for programs for the 2009 World Research Symposium. Judo 2009 Grand Prix Tunis. 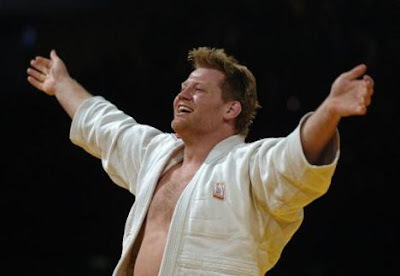 Dennis van der Geest says goodbye to judo. The 33-year-old judoka, who became heavyweight world champion in 2005, at a press conference announced that he was missing the motivation to proceed. At the Olympics in Beijing Van der Geest in his fight against Tamerlan Tmenov caught a serious arm injury. Since then he is no longer in action. Next weekend, he would make his comeback in Tunisia, but he is now off. Van der Geest wanted to stop after the World Championship in August in Rotterdam, but after the silver medal of competitor Grim Vuijsters at the European Championship qualification is little more feasible for the judoka who won bronze at the Olympics in 2004 and ten national and two European titles conquered. "Physically I was still on"
... Van der Geest said: "My feeling is that I still could win a medal at the World Championship. Rationally, I know that the deep motivation for everything to do not longer is present.